We said there were no losers in a BBQ war. But that doesn't mean that there are no winners. 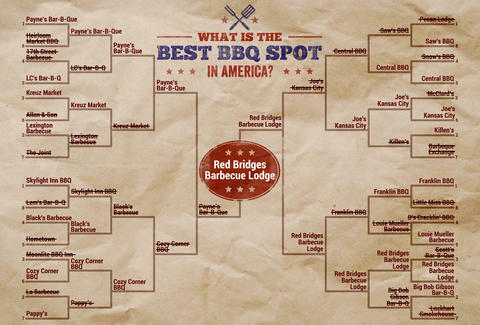 In fact, now that the coals have died on our BBQ bracket, we have a clear winner: Shelby, NC's Red Bridges Barbecue Lodge. You can read all about Red Bridges here, and all of our fantastic competitors on our list of the 33 Best BBQ Joints in America, all of which should have a place on your bucket list/combo plate (bucket plate?!). As far as the tournament itself, it was a wild ride! More than ¼ million ravenous BBQ fans weighed in throughout the five-round battle royale, which pitted pits from Texas, Memphis, the Carolinas, and beyond against one another. It all boiled down to underdog Bridges taking out Memphis legend Payne's in a championship that could help North Carolina forget about that other championship business this week. Cue the Petey Pablo, and fire up the pit... chopped pork is on the menu. Thanks to everyone who voted in this monumental battle of styles.